When is an excuse valid and when is it a cop out? This is something I’ve been asking myself all day, when I’ve struggled to finish writing this blog. Are my excuses good reasons to leave it for today, or are they an easy way to give up? But what can do? I’m a single dad, I’m raising two kids on my own whilst building a business from scratch… It is hard being mum, dad, cook, cleaner, managing director, content creator, book keeper, marketing manager, networker, oh, and doing the job that actually earns me the money to pay the bills which is producing directing, script writing, coaching, training and editing. So, it’s ok for me to say I’m tired… Isn’t it? But it’s not ok for me to use it as an excuse to avoid doing the thing I said I’m going to do. Surely I can have a break and leave finishing this blog til tomorrow, even though I said I’d write it today? It’s 10 pm. Back from our second rehearsal, a great read through of Acorn Antiques the musical, which we’ll be putting on at the Radlett Theatre in May. Now I’m finishing off this blog for publishing tomorrow and printing out a 114 page script, only 93 more pages to go. And although I’ve had excuses flying round my head all day, with lots of reasons for not finishing this blog, I’ve stuck with it… Why? So I listened to my excuses and said “thank you for sharing” to them and finished this blog… Well it will be in finished it two more short paragraphs. Do you have conversations with yourself? Do you give up when things get tough? Is keeping your work important to you? 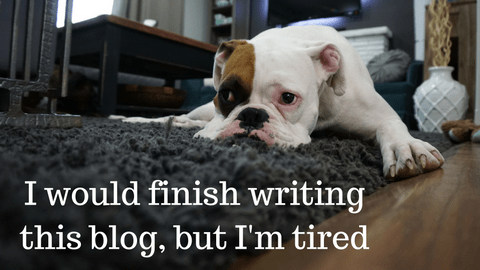 Please leave a comment below, as I’m interested in what you think and whether the struggle I had to go through to finish this blog was worth it. Off to get a blog done. A question of keeping my word to me!